Yesterday I posted an introductory image of the famous Auto Union racing car. It was my kick off to a series of illustrations painted with ArtRage for the iPad. Yes I said painted. Those of you that feel painting is only done with physical mediums move on and look no further. This is painting 21st century style. Today’s image is the “Bell Special”. I actually painted this before the Auto Union, and posted it to Facebook a few days ago. Since it was the first in the series, it gets the inaugural kick off. The process is the same. Photo that is sketched, not traced. Sketch is scanned, and refined in Adobe illustrator. The Illustrator line art is transferred to Photoshop and saved as a PNG which is transferred to ArtRage on the iPad via DropBox. From here it is painted out with a series of color reference photos. 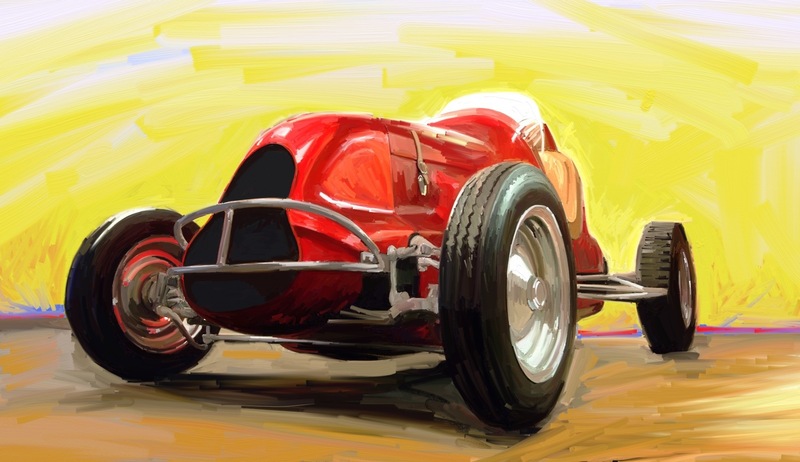 Posted in Design and Art, iPad Apps, Postaday 2011 and tagged Artrage, Bell Special, Illustration, iPad, MotorSports, Painting on December 4, 2011 by Author. ← An Exercise in Art Rage. The Classic Motor Sport Series.